Angelina Jolie is probably most well known for perfect pout and showstopping looks for which she has been credited as one of the worlds “Most Beautiful” women. So, it comes as no surprise Angelina is the #1 most requested celebrity when it comes to getting your lips plumped. Aging does have a way of getting to the best of us, find out what Angelina has done to keep up her beauty icon status. Angelina Jolie is a famous American actress and has been cited in many celebrity news, magazines and websites as one of the world’s “most beautiful woman”. She has stared in countless movies and won acclaim for her acting skills, as well as her work as a U.N. Representative. 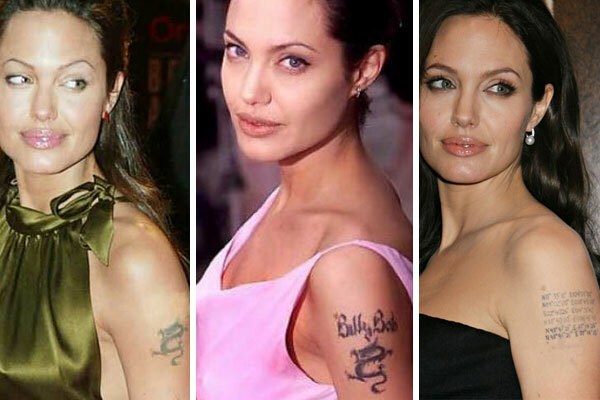 But one aspect of Angelina that fascinates many of her fans is her love for getting tattoos and exactly what they mean to her. Probably her most visible tattoo removal was the first dragon Angelina had tattooed on her left upper arm in 1997. In 2000 she later added the name of her second husband “Billy Bob” but had it removed after their divorce. In an interview during the time of the tattoo removal procedure she said, “I’ll never be stupid enough to have a man’s name tattooed on me again.” It took 5 visits to the tattoo removal clinic to erase the Asian dragon. In 2011 Angie added her partner Brad Pitt’s geo-coordinate as well as a flourish around the upper corner. On the inside of Angelina’s right forearm was a tattoo of lines she and former husband Billy Bob had designed together. She has since had the design covered with an Arabic script tattoo that means “Strength of Will”. The gothic lettering tattoo just under Angelina’s neck reads “Know Your Rights” and is the title of the song by The Clash, one of her favorite bands. According to Angelina, it is a slogan of empowerment which she described as “humanitarian, but a little punk rock”. She had this tattoo done in 2004 and has since added some flourishes below this tatt. On the inside of Angelina’s right palm is the letter “M” which is a tribute to her mother, Marcheline. Another one of Angie’s early tattoo’s was that of a Japanese symbol for “Courage”. She and ex husband Johnny Lee Miller had matching tattoos done and that is why she chose to have it removed, it didn’t feel like her own. On Angelina’s inner right thigh is the name “Whiskey Bravo” , which represents her partner Brad Pitt’s initials in the aviation alphabet, as Jolie and Pitt are both licensed pilots. Angelina’s left forearm now is emblazoned with many tattoos tied together with some fancy flourishes. The first is a coverup from where the “Courage” tattoo formerly was. In it’s place is a quote from famous author Tennesse Williams. “A prayer for the wild at heart, kept in cages.” She had this tattoo done in the presence of her mother, Marcheline Bertrand. Here is how she describes what the quote means to her. 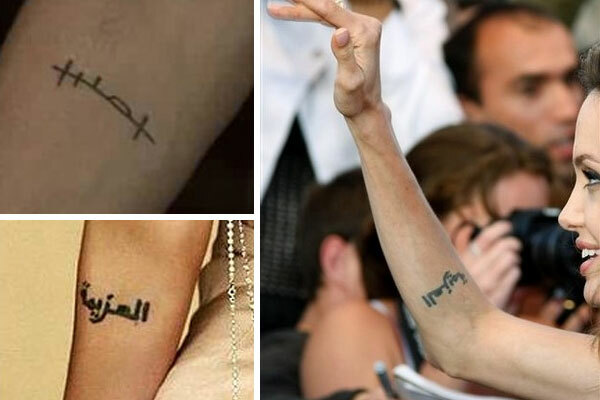 On Angelina Jolie’s inside left wrist is a rune style tattoo of the letter ‘h”. According to sources, it is to remind her of her brother, James Haven whereas some say it is to signify her ex-boyfriend Timothy Hutton. Knowing Angelina’s disposition to laser off any reminders of her past relationships, the former meaning is more plausible. Angelina’s lower back is always a work in progress it seems and is now the location of her biggest pieces, the bengal tiger. She started out with two iroquois symbols in 1997, and later added a tribal dragon inked in 1998, and later a blue window. The ‘window tattoo’ refers to her once held view on life: “Wherever I am, I find myself looking out of the window, wishing I was somewhere else.” The window has since been covered up by the tail of the Bengal Tiger. She had the window covered because she no longer subscribed to that view and she felt that she is “where she wants to be right now”. This 12-inch long, 8-inch wide Bengal tiger tattoo on her lower back was done in Bangkok in 2004, during a 2 hour session by tattoo artist Sompong Kanhphai who also blessed it by chanting an ancient hymn. Sompong also did her Khmer tattoo and Angelina said that she felt that her life had been filled with luck after she received the first tattoo from him. She had the tiger tattoo done to celebrate her Cambodian citizenship. According to press report, it took the tattoo artist, 2 hours to complete the design. 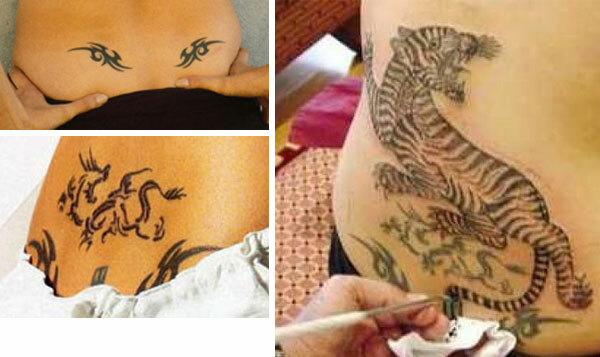 It took two hours to complete the tattoo because Angelina opted for a traditional Thai tattooing style. Purely by hand, the tattoo artist maneuvered a long needle that glides inside a hollow tube, delicately inking the skin manually. While tattooing, the tattoo artist chanted ancient Buddhist hymn to bless the tattoo. 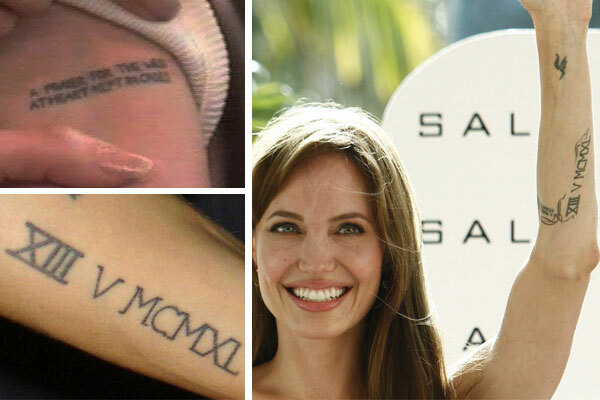 These are some more recent shots of Angelina Jolie’s additional flourishes she has added to her previous pieces. 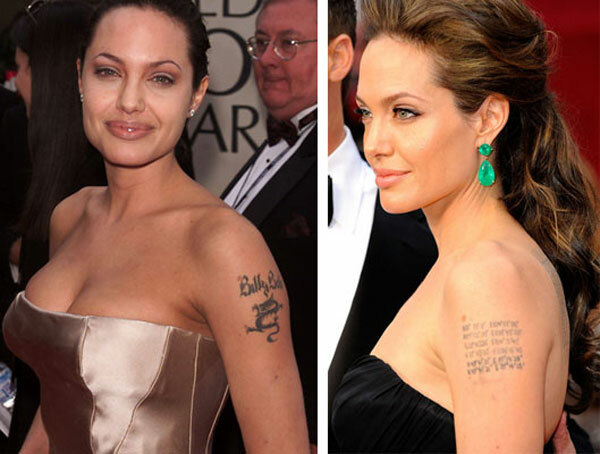 Angelina Jolie will forever be working on adding, removing, and covering up tattoos all over her famous body. What do you think of all that ink, does it work well for her? Angelina Jolie is undoubtedly one of the most beautiful leading actresses in Hollywood today. With her much sought after pout, not as much emphasis is put on the rest of her features. But upon the release of some early modeling photos of Angelina, we have discovered that her nose is very different than when she first started doing movies. With an obvious weight difference and aging aside, her new nose in these after photos is much more refined and slimmer overall. The decision to undergo plastic surgery for a rhinoplasty procedure was a good call for Angelina. We think she looks great with the new nose! On a side note, you can also see that her famous lips are 100% natural! Angelina Jolie is one hell of a beautiful actress with a serious love for getting inked! She is regularly featured in celebrity magazines and websites showing off her latest tattoo, coverup, or removal as the case may be. Angelina has at least a dozen tattoos all over her body and she also has alot of experience with tattoo removal as well. 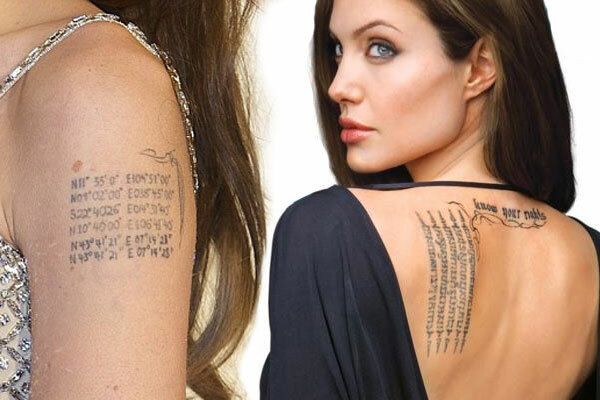 Angelina’s most famous tattoo removal and cover up is probably the Asian dragon and name of her ex husband that was located on her upper arm. She had it removed after they broke up. In an interview during the time of the tattoo removal procedure she said, “I’ll never be stupid enough to have a man’s name tattooed on me again.” It took 5 visits to the tattoo removal clinic to erase the dragon and you can still see it a bit. In it’s place Angelina opted to tattoo the geographical coordinates (longitudes and latitudes) from the locations where her children first entered her life. 1. N11° 33′ 00″ E104° 51′ 00″ : the place in Cambodia where Angelina Jolie’s eldest son Maddox was born. 2. N09° 02′ 00″ E038° 45′ 00″ : the place in Ethiopia were her daughter Zahara was born. 3. S22° 40′ 26″ E014° 31′ 40″ : the place in Namibia (Swakopmund) where Angelina gave birth to her biological daughter with Brad Pitt, Shiloh (Hebrew for “the peaceful one”), was born. 4. N10° 46′ 00″ E106° 41′ 40″ : the place in Vietnam where Angelina’s son Pax Thien was born.